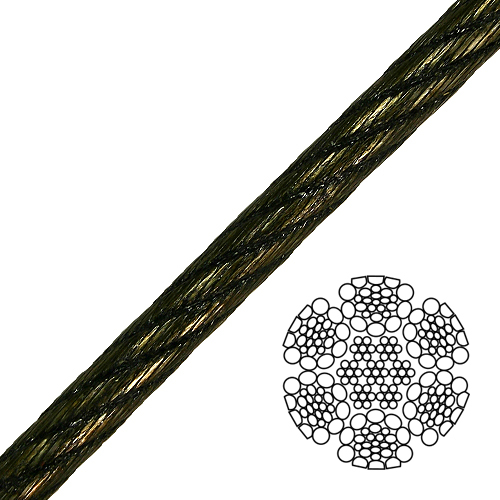 Swaged wire rope is a unique product. It offers greater strength than regular wire rope of the same diameter because it is compacted and has a greater linear density (it weighs more per foot). The swaging process makes wire rope smoother on the surface and therefore less prone to snagging and drum crushing. Essentially, it spools better and is easier on sheaves and drums. The outer strands are durable too, making this rope ideal for a rough life in the woods. Yes, this is the most popular wire rope we sell to our logging customers. Loggers know that it will outlast and outperform traditional cable by quite a margin. It is stiffer due to its compacted design, so it's not for everybody. But it excels when used as a skyline, guyline, dropline, skidding line, haulback or even as a drumline. Available in multiple sizes, we keep this rope in stock all year long. Mill certificates available upon request.